Research Data presentation, prelimanary outcome. Maternal vitamin B12 (B12) deficiency has an effect on neurodevelopment in utero and in infancy during exclusive breastfeeding. Maternal B12 deficiency also has an effect on brain development and stomach-mucosa in offspring rats and also can cause depression. Folic acid (FA) intake can masks and also exacerbates or worsen symptoms in B12 deficient patients and the foetus. FA intake during pregnancy is advised to prevent neural tube defects (NTD) in offspring. B12 status is related to NTD independently from folate status. In the Netherlands, for reasons of cost efficiency, FA is prescribed routinely for pregnant women without monitoring B12- or Folate status. Retrospectively we frequently observed in our outpatient clinic, that mothers of symptomatic B12 deficient children were diagnosed with B12 deficiency after giving birth to the child. To calculate the prevalence of maternal B12 deficiency and undiagnosed maternal B12 deficiency in a cohort of B12 deficient children. To investigate FA intake during pregnancy in undiagnosed maternal B12 deficiency in same cohort. To investigate severity of B12 deficiency related symptoms during pregnancy in undiagnosed maternal B12 deficient mothers including postnatal depression. 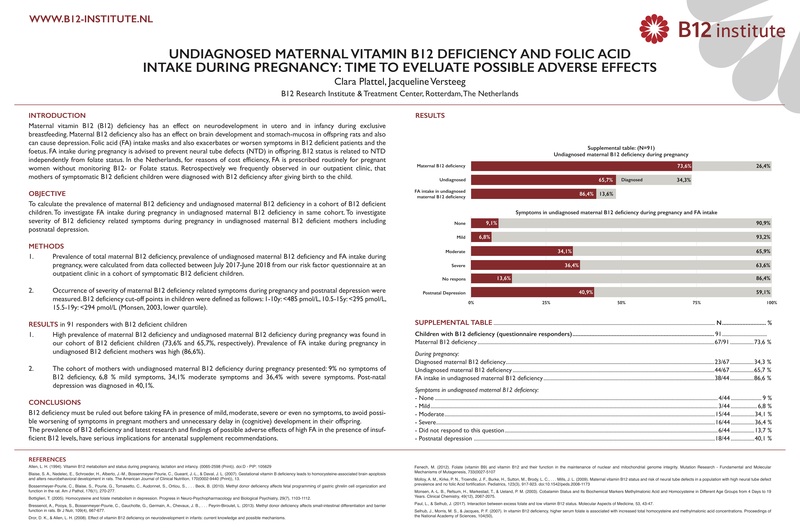 Prevalence of maternal B12 deficiency, prevalence of undiagnosed maternal B12 deficiency and FA intake during pregnancy, were calculated from data collected between July 2017 – June 2018 from our risk factor questionnaire at an outpatient clinic in a cohort of symptomatic B12 deficient children. Occurrence of severity of maternal B12 deficiency related symptoms during pregnancy and postnatal depression were measured. B12 deficiency cut – off points in children were defined as follows: 1 – 10y: <485 pmol/L, 10.5 – 15y: <295 pmol/L, 15.5 – 19y: <294 pmol/L (Monsen, 2003, lower quartile). Results in 91 responders with B12 deficient children. High prevalence of maternal B12 deficiency and undiagnosed maternal B12 deficiency during pregnancy was found in our cohort of B12 deficient children (73,6% and 65,7%, respectively). Prevalence of FA intake during pregnancy in undiagnosed B12 deficient mothers was high (86,6%). The cohort of mothers with undiagnosed maternal B12 deficiency during pregnancy presented: 9% no symptoms of B12 deficiency, 6,8 % mild symptoms, 34,1% moderate symptoms and 36,4% with severe symptoms. Postnatal depression was diagnosed in 40,1%. B12 deficiency must be ruled out before taking FA in presence of mild, moderate, severe or even no symptoms to avoid possible worsening symptoms in pregnant mothers and unnecessary delay in (cognitive) development in their offspring. The prevalence of B12 deficiency and latest research and findings of possible adverse effects of high FA in the presence of insufficient B12 levels, have serious implications for antenatal supplement recommendations.